Is it art if someone offers to love you for a day? It is according to American artist Kathe Izzo. She offered visitors her love by e-mail during Manifesta 4 in Frankfurt in 2002. She was not the only one with this ‘gift art’. She herself had actually been given the opportunity to participate in the prestigious Manifesta free of charge. That offer came from New York artist Sal Randolph, who had happily paid to take part herself: 15,099 dollars, to be precise. Once Randolph had secured participation, she decided to give everyone who applied to her the right to exhibit. My art work as a place to show your art work. Randolph bought her right to participate via eBay. From whom? From the artist that the Manifesta curators had originally invited: the Swiss Christoph Büchel. His art work comprised the auctioning of his participation rights, including the production budget, on Internet. Büchel opted for this stunt for the effect of market forces in his art. A provocative action in an art world characterized by the covert qualitative selection policy of a few curators. It turned into one of the most democratizing art works ever, thanks to Randolph’s decision to give everyone a place who wanted one. And with Izzo’s offer of love it even turned into an odd kind of altruism. A reverse market force, so to speak. 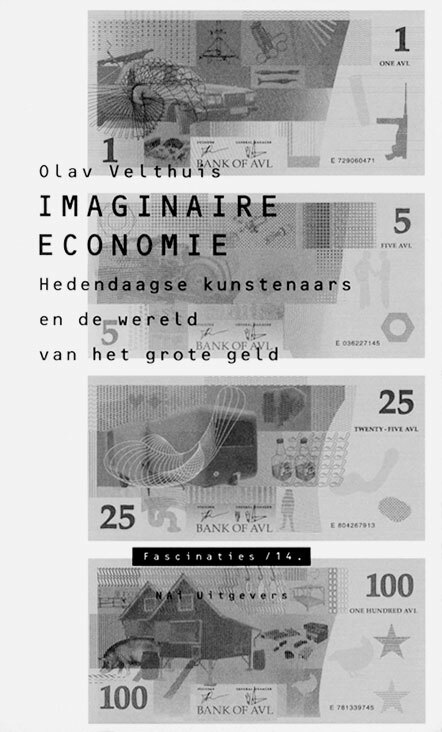 In Imaginary Economics Olav Velthuis describes how artists imitate and analyse the economy in their work. ‘Imaginary economics’ is art which – sometimes literally, sometimes in the form of parody or poetry – relates to the world of money and goods. Are artists part of the economy or are they on the outside? Does the economy affect them or do they in fact affect it? This is a bold viewpoint, since the reader may initially be inclined to think that art and economy are at least at loggerheads. After all, isn’t art a field that only exists outside the market’s paradigms of usefulness? Not so. According to Velthuis there are four identifiable kinds of ‘imaginary economics’ in twentieth-century visual arts. One critical, two affirmative and one that entirely avoids commenting on the interface between art and economy. It will come as no surprise that Marcel Duchamp is the scarlet thread running through this essay. Not only were his readymades in the 1910s a direct criticism of the idea and authenticity of art, but, with another, far lesser known work, he also laid the foundations for ‘imaginary economics’ in art. The Tzanck Check, a meticulously-produced imitation cheque, which Duchamp made out in 1919 for 115 dollars to his dentist, Daniel Tzanck, is the first example of imaginary economics, according to Velthuis. With the cheque, Duchamp exported an original artwork into the vast, anonymous flow of monetary barter products – a subtle statement that art cannot avoid participating in the economy. Duchamp’s work was an early example of critical imaginary economics, Velthuis’s first category. It is art that comments critically on the relationship between art and economy. Velthuis leads the reader past many artworks, all of which are somewhat rebellious. As in the case of Duchamp, Santiago Sierra or Hans Haacke, it can be interesting, distressing even. But unfortunately most examples are so inadequate, qualitatively speaking, that they deserve the name ‘carping art’ rather than imaginary economic art. There proves to be little art in that critical genre that rises above an aggrieved Calimero tone and really makes a lasting impression. Nevertheless, Velthuis’s story, with its essayist tone, does acquire the necessary acuity. Sometimes his comments on the works he discusses are critical – a critique even. Not a bad thing, as there are considerable differences in quality between his examples. And in the other categories – affirmative versions of ‘imaginary economics’ in which art embraces market forces or even participates in the business world – by no means all the artworks are comparable. The final category that Velthuis describes is somewhat confusing: a playful ‘imaginary economy’ which, in his opinion, is neither critical nor affirmative. Playfulness and ambiguity are his chief criteria. However, this group is hard to define, because the work of many artists from the former groups fits in this one too. After all, neither Duchamp, nor Warhol, Koons, Atelier van Lieshout nor Meschac Gaba, artists from the other categories, have created unambiguous art. This makes the standpoint of Imaginary Economics as audacious as it is provoking. Audacious because Velthuis indulges in rather exaggerated propositions, and provoking because he gives a penetrating analysis of both art and economy. If the two are indeed at loggerheads, the economy would seem, in this book, to be the winner for now – because it occupies so many artists and because it is gradually incorporating growing numbers of artists. Wieteke van Zeil (the Netherlands) is an art historian and journalist.